I'm going to start a new little thing after each special moment I have behind the lens. Minimal writing and just pure excitement through images that I have captured during some of my favorite moments in the outdoors. These will be a highlight basically showing you the best moments in a trip from start to finish. I hope you guys enjoy these photos as much as I do. Getting to edit photos after an awesome trip only brings those memories back and lets you relive the moments you captured. Not everyone can communicate through language because there are so many languages in the world but a photo certainly can be understood in every language and everyone can share the same blissful moments. I mean, do I need to really say anything? This place is insane. This little dude just sat and posed, he actually came in contact with the camera. Shot with my Zeiss Batis 25mm. These falls were one of my favorites to point my camera at, The size of the granite walls surrounding them was absolutely intimidating. 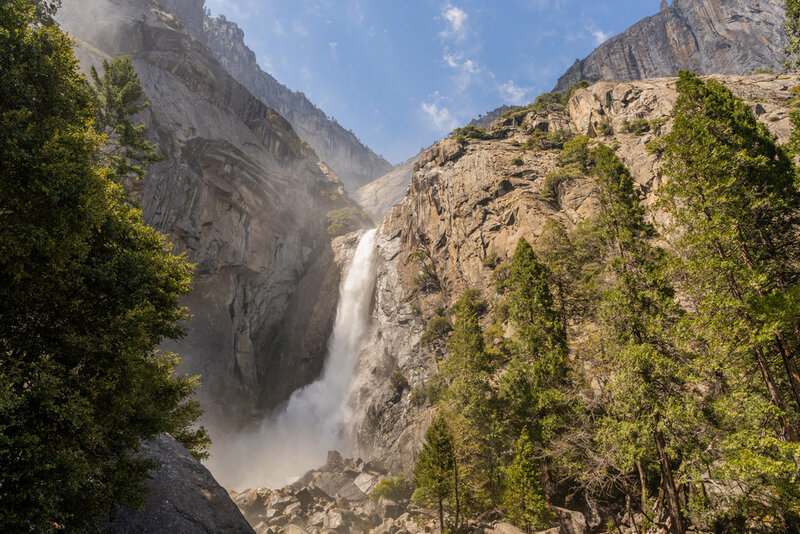 What's better than massive granite walls and waterfalls so large it's hard to even comprehend? Nothing. Don't even try to think of something, you won't find it. Standing at the top of this beautiful falls there were constant rainbows surrounding due to the mist being thrown from the crashing water of this beautiful waterfall. Walking up to the base of the Yosemite Lower Fall it's an absolutely incredible little path to get to feel the cold mist coming from the power of this beauty. Now that you've seen the entirety of Yosemite Falls here's a look up the falls skirt. This is Yosemite Lower Fall, it's effing incredible so go and check it yourself. Thanks for scoping out what I got to see in Yosemite, if you want a complete recap about this trip check out the write up I did about Yosemite from this recent trip. Lots of the same photos just a whole bunch of story to go along with it. Enjoy the start to your week folks!